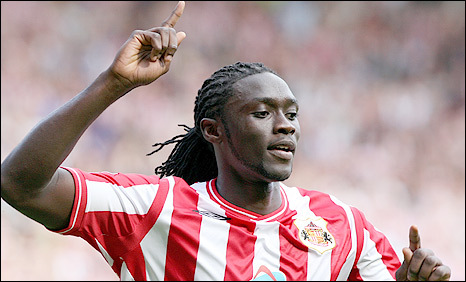 Striker Kenwyne Jones scored twice as Sunderland came from a goal down to beat Blackburn in a hard-fought game. Jason Roberts had a header disallowed for Blackburn before Gael Givet drove in an 18-yard shot to put Rovers ahead. But Jones rounded keeper Paul Robinson and slotted in and then powered in a header to put Sunderland in front. Benni McCarthy should have equalised with a close range header but his effort hit the crossbar, while Nikola Kalinic put a late shot horribly wide. Rovers will feel they deserved more from a determined performance and they will also feel hard done by because of some refereeing decisions, especially against Roberts and Steven Nzonzi. What are your thoughts on the game? Blackburn boss Sam Allardyce will be frustrated at a second successive defeat but he can find encouragement in his side's battling qualities. Allardyce's sides are always well drilled when it comes to set pieces and the visitors caused havoc in the Sunderland area with their aerial threat. Black Cats keeper Marton Fulop and his defence were unconvincing in dealing with the bombardment of corners, free-kicks and long throws being launched into the home side's box. Fulop was given a let off when the referee generously awarded a foul against him after he had missed a corner from El-Hadji Diouf and Roberts had nodded the ball in after it bounced back off the post. That effort might have been disallowed but the creaking Sunderland backline finally snapped under the pressure when a swinging Morten Gamst Pedersen corner was only cleared to Givet, who drove in a low shot to put Blackburn ahead. Allardyce had stressed the importance of his side getting of the mark points wise and his side had clearly taken his words on board as their desire was vastly superior to Sunderland's. The home side looked to be feeling the effects of having played on Tuesday in a defeat by Chelsea before they were given a way back into the game through a lapse in Blackburn's concentration. Centre-back Christopher Samba failed to intercept Steed Malbranque's through ball and Jones capitalised by running on to the pass, rounding the on-rushing Robinson and coolly slotting in. The goal provided fresh impetus to Sunderland, although they were given a scare when Fulop failed to catch a Diouf cross at the far post and debutant Zalinic stabbed the loose ball high from close range. The miss proved crucial as Sunderland went up the other end and showed the ruthlessness Blackburn lacked as Jones headed in Lee Cattermole's cross. Blackburn were not helped by captain Ryan Nelsen and striker Franco Di Santo having to go off injured during the game. The away camp were also unhappy when they were denied an equaliser after Nzonzi looped in a header only for Samba to be penalised for offside as he was deemed to be interfering with play. Kalinic's shot wide late on summed up Rovers' problems as they were shown the importance of having a striker of Jones's calibre. "We struggled in the first half after putting in a big 60 minutes against Chelsea. 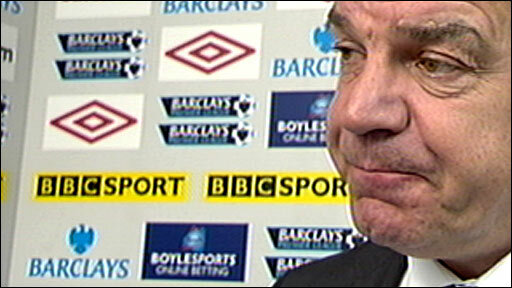 "We could not cope with Blackburn's physical threat in the first 45 minutes and we could not deal with them. "It has been a gruelling week for us and Blackburn were fresh for this match. "I am pleased we have dug in and got the win because we got off the hook a bit." "I'm really quite sick as our performances are not achieving the results we perhaps deserve. "We have to be more ruthless in front of goal and have to concentrate for 90 minutes, particularly defensively. "We feel a bit hard done by on the goals disallowed, certainly the first one. If that's an infringement, then there would be 20 free-kicks and penalties given in every game." 90:00+4:39 The game is over, as the referee blows his whistle. 90:00+4:04 Effort from deep inside the area by Nicola Kalinic misses to the left of the goal. 90:00+2:22 Substitution Fraizer Campbell joins the action as a substitute, replacing Darren Bent. 90:00+0:10 Lorik Cana restarts play with the free kick. 90:00+0:10 Booking Benedict McCarthy is given a yellow card. 90:00+0:04 Foul by Benedict McCarthy on Darren Bent, free kick awarded. 88:30 Foul by Christopher Samba on Lorik Cana, free kick awarded. Anton Ferdinand takes the free kick. 84:49 Foul by Keith Andrews on Phillip Bardsley, free kick awarded. Phillip Bardsley takes the free kick. 82:41 Inswinging corner taken left-footed by Morten Gamst Pedersen from the right by-line to the near post, clearance made by Darren Bent. 81:39 Lee Cattermole challenges Nicola Kalinic unfairly and gives away a free kick. Free kick taken by Keith Andrews. 80:04 Free kick crossed right-footed by Benedict McCarthy from left channel, Marton Fulop makes a save. 80:04 Booking Phillip Bardsley goes into the referee's book for unsporting behaviour. 80:02 Phillip Bardsley challenges Morten Gamst Pedersen unfairly and gives away a free kick. 79:47 Free kick awarded for an unfair challenge on Jason Roberts by Nyron Nosworthy. Direct free kick taken by Benedict McCarthy. 78:14 Substitution Steed Malbranque goes off and Jordan Henderson comes on. 76:57 Effort from just outside the area by Morten Gamst Pedersen goes over the bar. 74:47 Martin Olsson produces a left-footed shot from the edge of the box and misses to the left of the goal. Correction - 74:27 Christopher Samba takes a shot. 74:27 Jason Roberts takes a shot. 73:50 Lorik Cana challenges Benedict McCarthy unfairly and gives away a free kick. Free kick taken by Morten Gamst Pedersen. 70:26 Substitution (Blackburn) makes a substitution, with Benedict McCarthy coming on for El-Hadji Diouf. 68:04 Lorik Cana concedes a free kick for a foul on Jason Roberts. Paul Robinson restarts play with the free kick. 67:33 Shot by Phillip Bardsley. Blocked by Gael Givet. 66:48 El-Hadji Diouf is flagged offside by the assistant referee. Indirect free kick taken by Marton Fulop. 65:10 Foul by Keith Andrews on Kieran Richardson, free kick awarded. Anton Ferdinand restarts play with the free kick. 60:30 Effort from just outside the area by Lorik Cana goes over the bar. 58:39 Anton Ferdinand takes the direct free kick. 58:39 Substitution Nyron Nosworthy on for George McCartney. 58:39 Nicola Kalinic challenges Lorik Cana unfairly and gives away a free kick. 58:02 Shot from just outside the area by Nicola Kalinic misses to the left of the target. 54:44 The official flags Christopher Samba offside. Marton Fulop restarts play with the free kick. 53:58 Foul by Lorik Cana on Jason Roberts, free kick awarded. Free kick crossed left-footed by Morten Gamst Pedersen, Marton Fulop manages to make a clearance. 53:00 Assist on the goal came from Lee Cattermole. 53:00 GOAL - Kenwyne Jones:Sunderland 2 - 1 Blackburn Kenwyne Jones finds the net with a headed goal from inside the six-yard box. 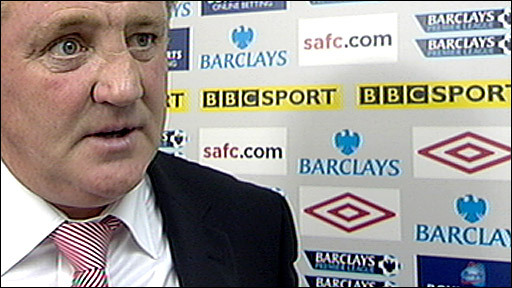 Sunderland 2-1 Blackburn. 52:05 Darren Bent produces a right-footed shot from the edge of the box and misses to the left of the target. 50:30 Free kick awarded for a foul by Martin Olsson on Darren Bent. Lorik Cana takes the free kick. 50:07 Shot by Nicola Kalinic from inside the six-yard box clear the bar. 49:50 El-Hadji Diouf crosses the ball, save by Marton Fulop. 48:14 Jason Roberts concedes a free kick for a foul on George McCartney. Marton Fulop takes the free kick. 46:03 Unfair challenge on Jason Roberts by Danny Collins results in a free kick. Shot comes in from Morten Gamst Pedersen from the free kick. 45:01 Substitution Ryan Nelsen leaves the field to be replaced by Martin Olsson. 45:00+2:45 The half-time whistle blows. 45:00+2:05 Shot from just outside the area by Morten Gamst Pedersen goes over the bar. 45:00+0:57 Free kick taken by Paul Robinson. 45:00+0:57 Booking The referee shows Lee Cattermole a yellow card for unsporting behaviour. 45:00+0:50 Free kick awarded for an unfair challenge on Lars Jacobsen by Lee Cattermole. 41:05 Lee Cattermole has a curled shot. Ryan Nelsen gets a block in. 40:51 Foul by Keith Andrews on Kenwyne Jones, free kick awarded. Kieran Richardson restarts play with the free kick. 40:14 Nicola Kalinic has an effort at goal from deep inside the area missing to the right of the goal. 39:33 A cross is delivered by Phillip Bardsley. 37:55 Morten Gamst Pedersen produces a right-footed shot from just outside the area that goes harmlessly over the target. Corner taken by El-Hadji Diouf, clearance by Marton Fulop. 33:32 Inswinging corner taken by El-Hadji Diouf from the left by-line, Christopher Samba gives away a free kick for an unfair challenge on Kenwyne Jones. Indirect free kick taken by Marton Fulop. 31:23 The assist for the goal came from Steed Malbranque. 31:23 GOAL - Kenwyne Jones:Sunderland 1 - 1 Blackburn Kenwyne Jones gets on the score sheet with a goal from inside the box low into the middle of the goal. Sunderland 1-1 Blackburn. 30:32 Lars Jacobsen takes a shot from 20 yards. Lee Cattermole gets a block in. 29:25 Christopher Samba produces a right-footed shot from the edge of the box and misses to the left of the target. 29:08 Ryan Nelsen decides to take a short corner. 28:47 Inswinging corner taken right-footed by El-Hadji Diouf from the left by-line, clearance by Lorik Cana. 28:31 Jason Roberts takes a shot. Blocked by Danny Collins. 27:44 Phillip Bardsley challenges Jason Roberts unfairly and gives away a free kick. Keith Andrews takes the direct free kick. 25:20 Jason Roberts challenges Danny Collins unfairly and gives away a free kick. Marton Fulop takes the free kick. 24:42 Free kick awarded for a foul by Christopher Samba on Kenwyne Jones. Marton Fulop takes the indirect free kick. 22:20 Ryan Nelsen concedes a free kick for a foul on Kenwyne Jones. Lee Cattermole takes the direct free kick. Shot by Kieran Richardson. Save by Paul Robinson. 20:12 GOAL - Gael Givet:Sunderland 0 - 1 Blackburn Gael Givet finds the back of the net with a goal from just outside the penalty box low into the middle of the goal. Sunderland 0-1 Blackburn. 19:50 Corner taken by Steven Nzonzi from the left by-line to the near post, Lee Cattermole makes a clearance. 19:31 Morten Gamst Pedersen takes a inswinging corner from the left by-line played to the near post, clearance by Danny Collins. 19:19 Corner taken by Morten Gamst Pedersen played to the near post, Kenwyne Jones makes a clearance. 19:02 Shot by El-Hadji Diouf. Save by Marton Fulop. 18:11 Free kick awarded for a foul by Lorik Cana on Morten Gamst Pedersen. The free kick is swung in right-footed by Keith Andrews. 17:30 Effort from just outside the box by Lorik Cana goes over the bar. 17:00 The offside flag is raised against Nicola Kalinic. Indirect free kick taken by Danny Collins. 16:01 Unfair challenge on El-Hadji Diouf by Phillip Bardsley results in a free kick. Paul Robinson takes the indirect free kick. 14:56 Shot on goal by Morten Gamst Pedersen from just inside the area clears the crossbar. 13:58 The ball is delivered by Kenwyne Jones, Ryan Nelsen makes a clearance. 13:43 The referee gives a free kick against Keith Andrews for handball. Phillip Bardsley takes the indirect free kick. 13:04 Substitution Nicola Kalinic comes on in place of Franco Di Santo. 11:12 Jason Roberts concedes a free kick for a foul on George McCartney. Marton Fulop takes the free kick. 9:49 Centre by Steed Malbranque, Christopher Samba manages to make a clearance. 9:24 Steven Nzonzi challenges Steed Malbranque unfairly and gives away a free kick. Kieran Richardson takes the free kick. 8:19 Shot by Steven Nzonzi from outside the box goes high over the crossbar. 5:28 Franco Di Santo is ruled offside. Indirect free kick taken by Marton Fulop. 4:08 Christopher Samba takes a shot. Lee Cattermole gets a block in. 3:13 Inswinging corner taken right-footed by Keith Andrews, free kick awarded for an unfair challenge on Marton Fulop by Christopher Samba. Marton Fulop takes the free kick. Correction - 3:08 Christopher Samba takes a shot. Blocked by Lee Cattermole. 2:33 Morten Gamst Pedersen takes a inswinging corner from the right by-line played to the near post. 0:48 Free kick awarded for an unfair challenge on Franco Di Santo by Danny Collins. Free kick taken by El-Hadji Diouf. 0:00 The ref blows the whistle to begin the match.